Guest blog by Grandbaby Cakes. 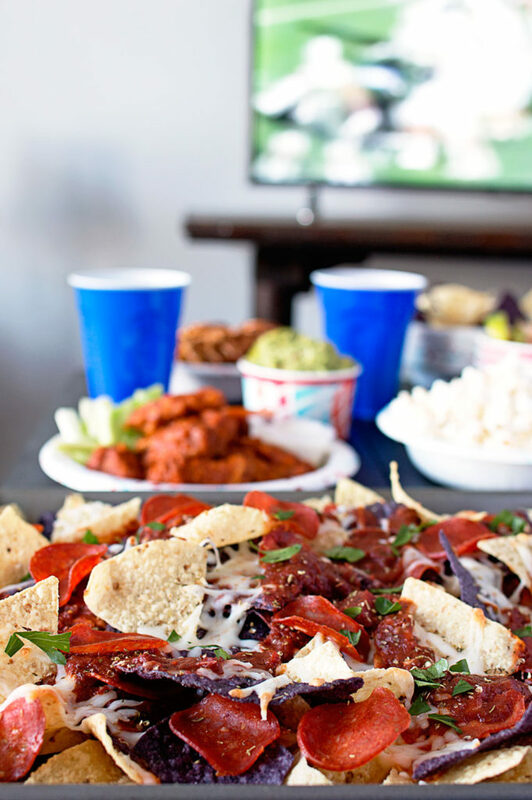 From football to basketball, I am all about the game day entertaining. I know that when most people see the word “entertaining” they immediately think of the words “fussy” and “complicated”. 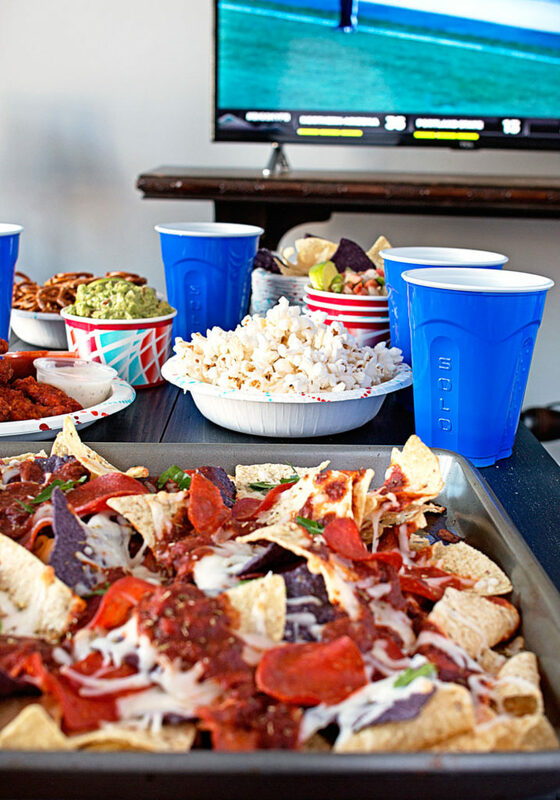 However, entertaining for game days doesn’t have to be difficult. In fact, it can be super effortless with a little help from Solo. I love using Solo for all of my entertaining needs. They always bring the fun to a party. With their eye popping designs and vibrant colors, your guests will feel like you definitely upped the ante. From plates and bowls to cups, there are numerous ways to use their products for your entertaining needs. Here are some of my favorite tips for making your game days as effortless yet flawless as possible. Keep it relaxed and approachable. 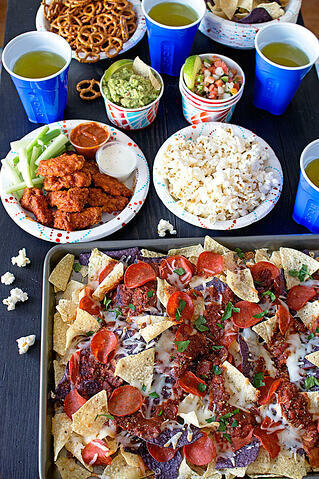 Game days are all about chilling out around the tv with comfort apps like wings and these awesome nachos. No need to slave in the kitchen or spend too much time styling an extravagant set up. Relaxed is key. Do a mix of store bought and homemade treats. Order up some wings from your favorite spot and couple them with homemade guacamole, salsa and store bought chips. The guac and salsa are perfect for pairing with Solo bowls. Keep the colors fun! Bright colors and fun patterns are always amazing for game days. It really keeps the energy high. Go with the flow: Don’t worry about over planning. The best times happen when you just let go and let flow. I can’t tell you how much fun I have when I don’t overthink my party planning. Everyone just cuts loose! 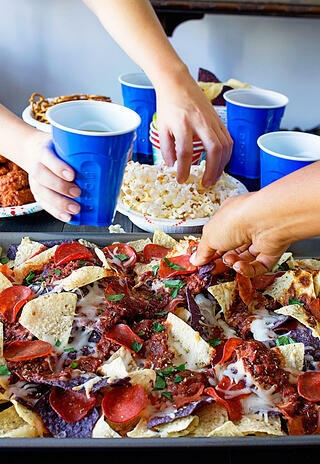 These pizza nachos are perfect for effortless entertaining. They couldn’t be easier to make, and they taste absolutely delicious!!! You can also adapt them with some of your favorite pizza toppings to make the recipe different every single time you serve them. I opted for a pepperoni pizza vibe since that is my fave pizza topping. I added a few other toppings like oregano and parsley for some color and a gourmet feel as well. The sky is truly the limit for how you approach this recipe. Serve on your fave Solo plates and get ready for some game day fun. 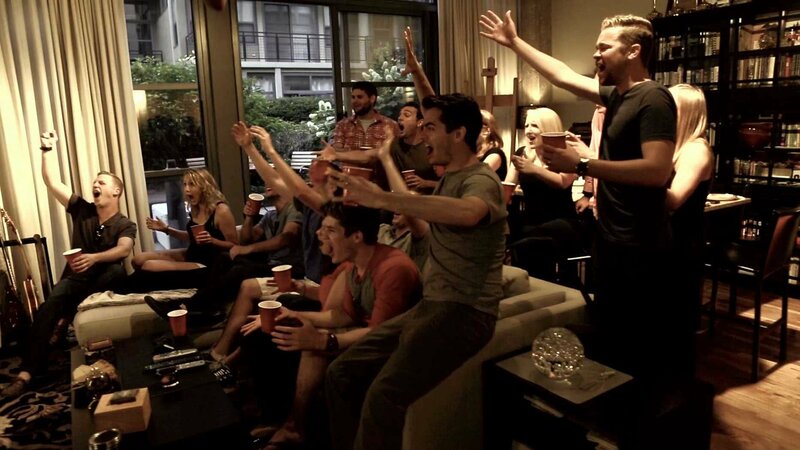 Remember, at the end of the day, it’s all about fun (and of course your favorite team taking the win!). Check out this original post along with other great recipes and tips on Grandbaby Cakes.